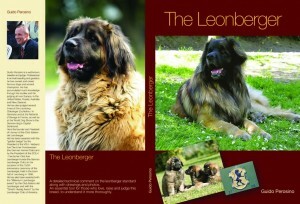 A detailed technical comment on the leonberger standard along with drawings and photos. An essential tool for those who love, raise and judge this breed, to understand it more thoroughly. You can purchase the PDF version via email or the “physical” book via Express Courier. Guido Perosino’s “The Leonberger” is essential reading for any serious Leonberger enthusiast .To fully appreciate this splendid breed, one must look beyond the mere mechanics of form and structure; to see past the basic points of the standard and to seek instead a fuller aesthetic appreciation of the whole. To see with the eyes of both artist and engineer. This is precisely what Perosino’s book achieves, for it is far more than a simple illustrated standard. Instead, this book provides an in depth examination of the breed; its history, quality, structural anatomy, role, versatility and character. It is a celebration of the breed and should become a well-thumbed part of any Leonberger owner’s collection. “Books on the Leonberger published in the past have essentially addressed amateurs and beginners. This book goes far beyond such an approach”. This is the ultimate guide and definitive handbook on the Leonberger for the serious enthusiast and up and coming judge. The balanced view of all aspects of the breed, at home, at work and in the show ring together with the historical element make it a vital part of ones library. The excellent drawings, text and photographs describe the finer points and nuances that define the Leonberger and give an exceptional incite into the Breed from the eye of an international expert. A foremost European Leonberger breeder and judge, Guido Perosino, has published a new edition of “The Leonberger”, a book about the Leonberger dog. It includes a complete history of the earliest years of the breed as well as articles about recent showing and working characteristics of the breed in the United States. The drawings, photographs and written descriptions leave judges, breeders and owners with a clear vision of what the ideal Leonberger should look and be like. This book offers a unique opportunity to meet one of the newest AKC Working Dog Breeds from the eyes of a Master.